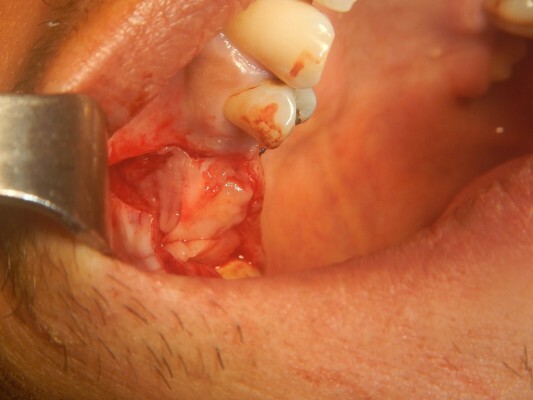 Abstract: An oroantral fistula is a complication of the maxillary posterior teeth that can occur after a tooth extraction that affects the maxillary sinus. Improper management may lead to a persistent fistula, which may become chronic. In this case report, platelet-rich fibrin (PRF) was used with a collagen membrane to close a chronic fistula in a single patient. A flap was raised, the oroantral fistula tract was eliminated, and the opening was closed with a resorbable membrane as a first layer and covered with a PRF clot as a second layer. The flap was closed, and the patient was followed up for suture removal and confirmation of complete soft tissue closure. The postsurgical sign and symptoms of the patient disappeared in the first week; complete tissue healing was detected within 2 weeks, and tissue hypertrophy was observed in the fourth week. The use of PRF may have advantages for soft-tissue healing and for accelerating soft tissue formation by subsequent hypertrophy.